An Ancient Solar System...: The Universe In 101 Words: Rogue Black Hole Ahead! The Universe In 101 Words: Rogue Black Hole Ahead! Bad day? Any inhabitants of the galaxy pictured are getting a worse one. 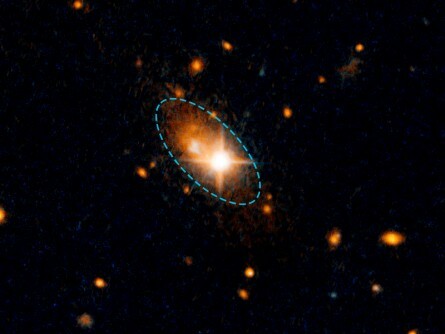 A black hole the size of a solar system is barrelling through it at 2000 km/s - far faster than any space ship. How? Huge black holes result from smaller holes merging. This merger gave off massive gravitational waves, equivalent to 100 million supernova - hurling the monster hole through space. Worlds caught in its path wouldn't see darkness approaching though - the hole's dragging clouds of superheated gas along. Instead the sky would get brighter and hotter until the very rocks boiled.